Drogo’s fascinating captive is nothing like he anticipated. Outspoken but innocent, Isabel reluctantly submits to Drogo's tutoring in the spymaster's craft, as well as the art of making love. But their potent attraction nearly leads to disaster. In the end they must decide between their dueling appetites for riches and revenge...or love. This is my first book from Oberon Wonch and I was not disappointed, I am rather sad that I hadn't found her before now. 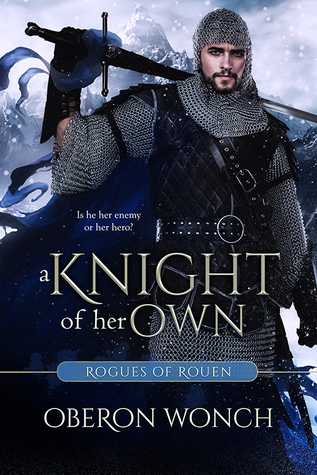 A Knight of Her Own was the perfect book to bring me out of a book slump I'd fallen into after one too many just okay romance reads. 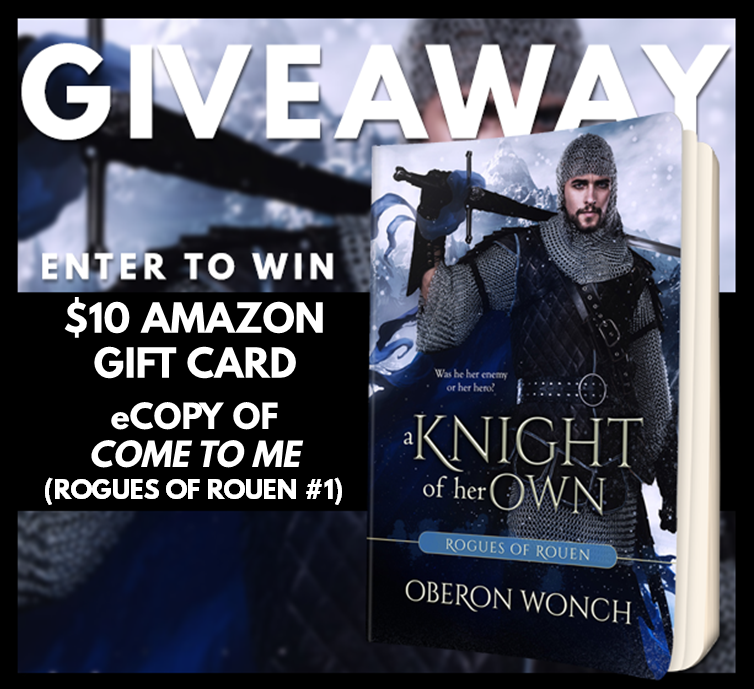 Drago LaForce, a Knight of the Norman Realm, particular 'friend' to the Norman King has been sent out to discover if the rumors of treachery against the current Earl of WulfLandt, who happens to be related by marriage to the King, making disposing of him rather difficult. To aid in Drago's task he captures (but does not kidnap, riiiight, haha) Lady Isabel, who was the past Earl of WulfLandt's daughter and is known as the Blue Lady. The Blue Lady is known through out the lands as a woman not to be trifled with. She lures Norman fighters into her clutches through seduction and in essence 'de-mans' them. She loathes the current Earl of Wulflandt and may be the only person that can bring him to his knees. However, Drago soon learns that the legend of the Blue Lady does not match the truth of Lady Isabel and that Lady Isabel is in truth not so much the Lady he expects but rather bit of a wild ruffian. To get the Earl into his clutches he needs The Blue Lady, he needs a skilled seductress, his only option now is to turn Isabel into a myth and manage to not fall for her in the process. Isabel is scared for her family, angry to the point of severe prejudice at the Norman invaders (who can blame her?) finds herself in taken into the clutches of the legendary Drago LaForce. To protect her people and rid their lands of tyrant she must step out of her comfort zone and become a woman meant to seduce men. Our naive heroine must quickly accept that her future, the future of her people and her lands lie in her ability to tempt and tease. I really felt for Isabel and Drago in this story. I loved how well the author painted their pasts so clearly for us and how well her characters develop through out the book. These two both come at each other from a place of anger, frustrations and pain and while the road is not smooth believing in their story and in their love is easy to do This isn't an insta-love, there is an immediate attraction but the love comes about over time and through great trial and error. One of my favorite traits of Drago is that while he is doing what he feels he must do and while that at times hurts both Isabel and himself you always see that everything he does is laced with kindness, he is truly a good man. He's not the bad boy who becomes a good man, he is simply a hero with a golden heart. Isabel and I could have been great friends I think. She's a determined heroine with a spirited heart. She does what needs to be done and accepts that life, especially the life of a woman in this era, is not going to be easy. She understands that her future is set, she is a Lady and there are expectations and realities that have to be met. She may find herself resigned to what is to come, she may know where her duty lies and it may not be what she wants but she will do what needs to be done, she will give her people and her lands all of herself to protect them. I loved that about her, her strength is extraordinary and Drago is the perfect man for her because he can handle and nurture that strength. I am also quite fond of her propensity to cuss, she is truly a woman of my heart, haha. 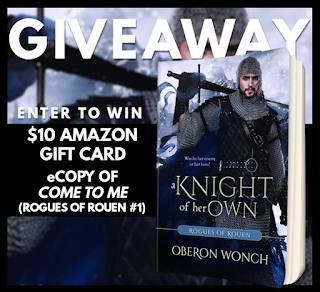 A Knight of Her Own is a wonderful Historical Romance, light enough to make it an easy read but with enough substance and heart to make it one that will leave you completely fulfilled. I will say that I found a few times where I was wondering what I missed, particularly when it comes to the back story of the Rogues of Rouen. I am assuming that there is more history in the first book so I am definitely going back to read Come to Me. I won't say that you have to have read it, I think they can all be safely read as stand-alones but there is clearly a past that I missed out on and I am hoping to discover more about it when I go back to book one. I will definitely be keeping up with this series and am very excited for more. I hope it won't be long between books as I noticed there was quite a gap between books 1 and 2 but maybe if I talk this up enough and convince all the Historical Romance fans out there to give this book a go (you won't be disappointed) we will see future books coming along quicker! So go out and get this one and then settle in for an adventure! 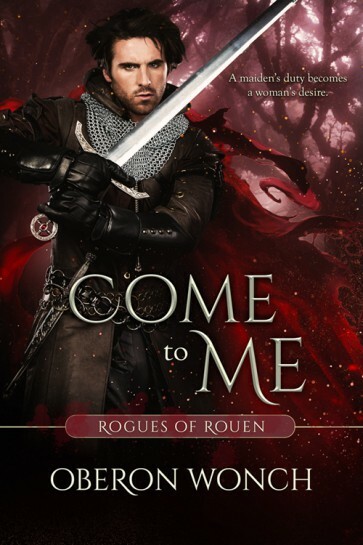 Don't miss the first book in the Rogues of Rouen Series! Oberon Wonch has engaged in a love affair with books for as long as she can remember. Penning her own stories from an early age, she later earned a degree in World Literature while studying several languages—all in order to learn what makes a tale endure the ages, but really just to read more books. Her very favorite stories—both to read and write—are those that celebrate the happily-ever-after. An avid gardener and armchair archaeologist, she grew up in northeast Ohio but now lives in Indiana with her college sweetheart husband and two very joyful little dogs.